Live Security Professional is a fake anti-malware. It displays fake alert messages, prevent execution of legit programs and detects inexistent infections to scare users. 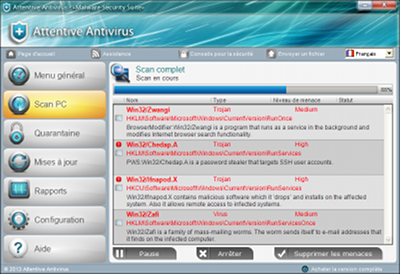 Attentive Antivirus is a fake anti-spyware tool. It displays fake alert messages, prevent execution of legit programs and detects inexistent infections to scare users. It is a modified clone of System Doctor 2014, System Care Antivirus, AVASoft Professional Antivirus, Disk Antivirus Professional, System Progressive Protection, Live Security Platinum, Smart Fortress 2012, Smart Protection 2012, Personal Shield Pro.